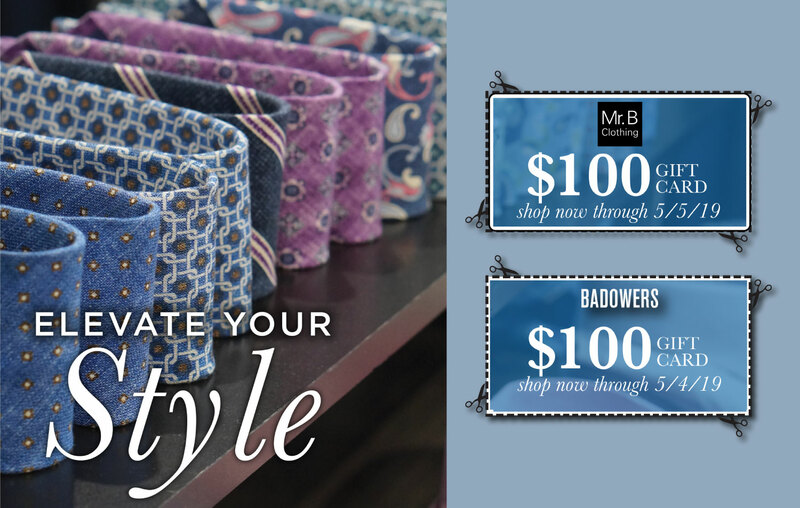 Elevate Your Style & Shop Mr. B and Badowers for the Best in Men’s Luxury Fashions. Shop brands Canali, Stenstroms, St. Croix, Corneliani, Samuelsohn, Peter Millar, Johnnie 0, Robert Graham, Magnanni, Santoni, Gravati & MORE! Gift card for $100 off your purchase of $400 or more. Valid on new purchases only. Two offers per customer – print and/or digital. Not valid with any other offer. Valid on regular price merchandise only. Must have offer: Gift card will be emailed upon submittal. If you ever need anything, just contact us. We’re always happy to help! Sign up here for our loyalty rewards program! Earn 1 point for each dollar spent. Receive a $25 gift card for every 1000 points.